Do you suffer from a swollen and painful bunion that makes walking and doing basic activities almost impossible? Looking for an effective treatment or remedy that will help ease the pain and restore normal foot operation? Extreme Cart silicone bunion corrector is just what you need. It can be used 9 different ways and offers excellent support to the bunion joint, restoring natural realignment to the bones and relieving the pain experienced. The hinged design of this bunion splint toe corrector also allows natural movement for your toes and feel while ensuring that they are still perfectly aligned all day long. Our orthopedic bunion corrector is made from high quality materials that do not only guarantee effective treatment, but also excellent durability. If that is not all, an ergonomic design ensures you are completely comfortable, to the point of forgetting that you are actually wearing it. Combine that with the pain relief you get from using this tore corrector and you have yourself the best and most effective treatment for bunions. Why continue suffering in silence? Click 'Add to Cart' now and get the best and most effective 9-in-1 bunion corrector. You'll love that you did. 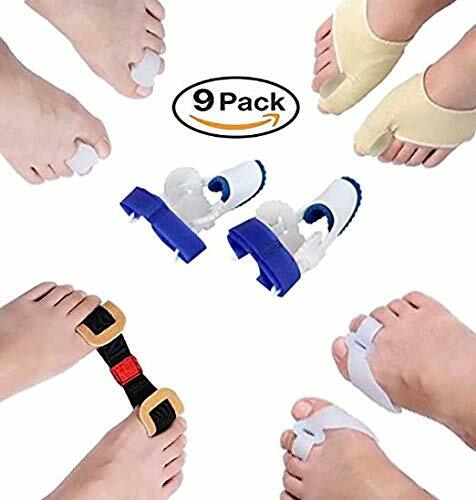 This 9 in 1 Orthopedic Bunion Corrector set gives support to your toe because a proper care needs to treat this problem, otherwise the pain increases by the time. Callus, Corns, Blistering, Busitis, Metatarsalgia, Hammertoe, ingrown nails and inflammation are bunion complications. The Blue and White Bunion Corrector is the best Support for the users to wear at night. The patient can feel difficulty in walking and pressing the feet during moving. A severe pain in the joint enhances the problem. If you have any questions about this product by Extreme Cart, contact us by completing and submitting the form below. If you are looking for a specif part number, please include it with your message.